With the final curtain fallen on NEARfest in June 2012, a void has been left in the once-thriving US progressive rock festival scene. In the past couple of years, the increasing fragmentation of the target audience – as well as other factors such as the lingering economic downturn – have provided a brusque reality check to anyone daring enough to invest time and money in this often unrewarding task While the cottage-industry organization of ProgDay is still going strong (probably because of its unpretentious structure), and ROSfest keeps attracting a steady number of devotees to its Gettysburg premises, other more ambitious efforts have ended in failure before they even started. The enthusiasm about Baja Prog’s return after a four-year hiatus was tempered by a lineup that penalizes US bands, and is in many ways a duplicate of the last NEARfest – not to mention that the festival takes place in a part of the continent that is not exactly convenient for many US dwellers. However, almost unexpectedly, a new event has stepped in at that particular time of the year, though in no way aiming to fill NEARfest’s daunting shoes by offering a range of reasonably high-profile bands, including some “bucket list”ones. In fact, the organizers of Seaprog Music Festival seem to have taken the ProgDay template even further, concentrating almost exclusively on US acts and spotlighting local talent. 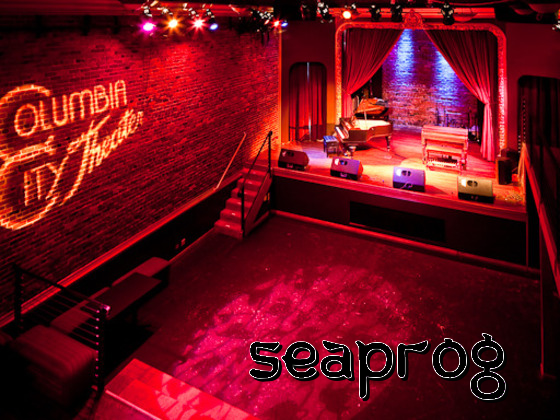 The event is scheduled for June 28-30, 2013, at Columbia City Theater, a nearly 100-year-old venue in the iconic Pacific Northwest metropolis of Seattle – home to such diverse acts as Jimi Hendrix, Heart, Queensryche and the grunge bands of the early Nineties. Starting on the evening of Friday, June 28, with a free show, the festival proper will be spread over the whole of Saturday and Sunday, showcasing a total of 11 bands. Seaprog comes with the uncompromising tagline of “not your parents’prog” and a well-articulated manifesto that invites people to be open-minded in their approach to the world of non-mainstream music. In spite of the many attempts to separate “prog” from the original meaning of the word “progressive”, and turn it into nothing more than a codified genre complete with plenty of sarcasm-inducing mannerisms, there are still those who want “progressive” to be much more than a byword for self-indulgence and worship of the past. The members of the organizing committee are dedicated musicians with years of experience under their belt: guitarist Dennis Rea (of Moraine and Iron Kim Style fame), drummer John Reagan (formerly of Harlequin Mass, now with Dissonati) and stick player Jon Davis (currently a member of Zhongyu with Rea and Moraine’s Alicia and Jim DeJoie). All three of them share similar views on what constitutes “prog”, which may not necessarily resonate with those who espouse the “prog as a genre” theory, but will instead find support in genuinely adventurous listeners. The event is a strictly non-profit venture, and the organizers’s main aim in undertaking this effort, as stated at the bottom of every page of Seaprog’s excellently crafted website, is to offer a world-class music event in a city that is better known for heavy rock and trendy alternative/indie bands. As can be expected after reading the festival’s manifesto, Seaprog is heavily geared towards the cutting-edge side of the progressive rock spectrum, with seminal RIO/Avant band Thinking Plague in the coveted spot of Sunday headliner for their first-even Seattle show. The Colorado-based outfit’s latest recording effort, Decline and Fall, was one of the defining albums of 2012, and their triumphant appearance at last year’s RIO Festival helped to consolidate their reputation as purveyors of difficult but highly rewarding music. Thinking Plague’s Dave Willey and Elaine Di Falco will also appear on stage with Hughscore Revisited, a quartet that will perform compositions by legendary Soft Machine bassist Hugh Hopper, who passed away in 2009. Not surprisingly, Moraine, Zhongyu and Dissonati will also be on board. The other names on the lineup are less familiar to the majority of prog fans: local outfits Alex’s Hand, Monkey Bat Operation ID and Trimtab (originally formed in Minneapolis, but now based in Seattle), and Italian multi-instrumentalist Jolanda. At the time of writing, the Saturday headliner remains to be announced. Links to all of the artists’ webpages are available on the event’s site. A Kickstarter campaign will also be launched to finance recording of the shows. After so much fretting about the future of the US festival scene following the demise of NEARfest and the cancellation of OhioProg and FarFest, it is heartwarming to see people take things into their own hands in order to promote homegrown talent, even though on a much smaller scale than NEARfest, ROSfest or Baja Prog. As I have often written on these pages, this is probably the most viable model, which allows the organizers not to be bound by the necessity of filling a larger venue, therefore having to budget for inevitably more expensive “international” bands. Hoping for a healthy turnout that will allow the festival to continue at least in 2014, I applaud the organizers for their bravery and dedication to the cause of progressive music.